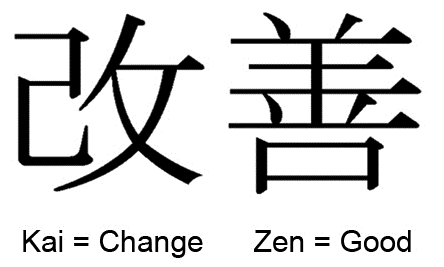 Word “kaizen”, where “kai” = change “zen” = good, simply means “change for better”. In English kaizen is typically applied to measures for implementing continuous improvement. Kaizen is an approach to activity organisation based on common sense, self-discipline, order and economy. Kaizen method is a strong contributor and fundamental part of a lean production process model in lean manufacturing. It is also applicable to lean software development and personal endeavours. Kaizen refers to any activities that continually improve all business functions or processes and involves every employee from the CEO to the assembly line workers. Labeling industrial or business improvement techniques with the word “kaizen” is the common practice in Japan. It also applies to processes, such as purchasing and logistics, that cross organizational boundaries into the supply chain. With Kaizen management practises, the main priority is given to the manufacturing process, as the process of achieving results is not less than the final result. The reason for this focus is that imperfect processes could potentially not lead to achieving the goal. A corresponding task of kaizen is to become a part of market by improving processes within the organisation instead of pushing products into the market. One of most important tasks in Kaizen involves improving the quality of work in an organisation by achieving TQC (total quality control). 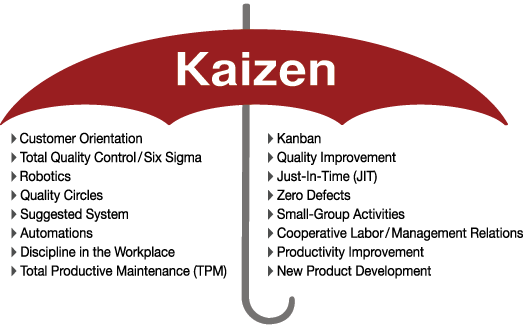 The kaizen method is now a base model for other quality improvement methods including: suggestion systems, automation, small group activities, Kanban system, just-in-time, zero defects, total productive maintenance, total quality control, etc. The history of Kaizen begins after World War II when Toyota first implemented quality circles in its production process. This was influenced in part by American business and quality management teachers who visited the country. A quality circle is a group of workers performing the same or similar work, who meet regularly to identify, analyze and solve work-related problems. This revolutionary concept became very popular in Japan in the 1950s and continues to exist in the form of Kaizen groups as well as similar worker participation schemes. The term Kaizen actually became famous around the world through the works of Masaaki Imai. Masaaki Imai (born, 1930) is a Japanese organizational theorist and management consultant, known for his work on quality management, specifically on Kaizen. In 1985 he founded the Kaizen Institute Consulting Group (KICG) to help western companies introduce the concepts, systems and tools of Kaizen. At present time, the Kaizen Institute team has applied the lean methodology and kaizen training courses across virtually all business sectors throughout the globe. Masaaki Imai published two fundamental books on business process management “Kaizen: Japanese spirit of improvement” (1985), which helped popularize the Kaizen concept in the West, and Gemba Kaizen: A Commonsense, Low-Cost Approach to Management (1997). In modern usage, kaizen is designed to address a particular issue over the course of a week, which is referred to as a “kaizen blitz” or “kaizen event”. A kaizen event is a focused development project that can accomplish breakthrough improvements in a short amount of time, about 2-10 days in scope. Kaizen events must have a clear, concise objective along with immediately available resources and rapid results. This ensures the results are significant, clear and quick to promote the generation of continued enthusiasm and satisfaction. Accept no excuses and make things happen. Say no to the status quo of implementing new methods and assuming they will work. If something is wrong, correct it. Empower everyone to take part in problem solving. Get information and opinions from multiple people. Be economical. Save money through small improvements and spend the saved money on further improvements. Remember that improvement has no limits. Never stop trying to improve. Kaizen method strives toward perfection by eliminating waste (muda) in the workplace (gemba). The goal of kaizen is production without wastes by improving standardized activities and processes. Industrial engineer Taiichi Ohno, the father of the Toyota Production System, noticed that there is an 80% loss in every process and the value of the process is less than 20%. Delay, waiting or time spent in a queue with no value being added. A large part of an individual product’s life is spent waiting to be worked on. Producing more than you need. Overproduction usually hides and/or generates all the others. It leads to excess inventory, which then requires the expenditure of resources on storage space and preservation. These activities do not benefit the customer. Over processing or undertaking non-value added activity. Over processing occurs when more work is performed on a piece than what is required by the customer. Transportation. Each time a product is moved, it stands the risk of being damaged, lost, delayed, etc. as well as being a cost for no added value. Unnecessary movement or motion. Motion refers to the damage that the production process inflicts on the entity that creates the product. This may be either over time (wear and tear for equipment and repetitive strain injuries for workers) or during discrete events (accidents that damage equipment and/or injure workers). Inventory. Whether it is in the form of raw materials, work-in-progress, or finished goods, represents a capital outlay that has not yet produced an income, either by the producer or for the consumer. Production of Defects. Defects cause extra costs for reworking the part and can sometimes result in doubling the cost of one single product. Genba (also romanized as gemba) is a Japanese term meaning “the real place”. In lean manufacturing, the idea of gemba is that the problems are visible and the best improvement ideas will come from going to the gemba (the factory floor in manufacturing). The gemba walk is an activity that takes lean management to the front lines to look for waste and opportunities to practice gemba kaizen, or practical shop floor improvement. The term gemba, in international practice, became widely known after publications about the Toyota quality management system. In practice, if a problem occurs, the engineers must go to the source to understand the full impact of the problem, gathering data from all sources. Japanese decision-making principle differs from a traditional american management approach where decisions are typically made remotely. When a difficulty (abnormality) arises, go to gemba first. Check with gembutsu (machines, tools, rejects, and customer complaints). Take temporary countermeasures on the spot. Find out the root cause. By repeating the question “why” several times, you can find out the root cause of the problem. Standardize for prevention of recurrence. In today’s situation of having to manage multiple projects and to make decisions quicker, managers often try to apply the latest high-cost technologies to handle problems that can be solved with a commonsense, low-cost approach. 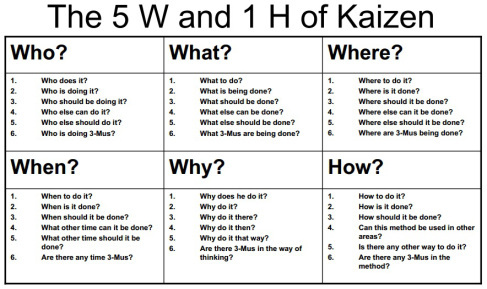 The kaizen method involves the usage of simple tools, checklists, and techniques. It doesn’t require the investment of a great deal of money yet offers substantial benefits to any business. At the same time, if you are a fan of technologies and understand kaizen approach is exactly what your organization needs to implement, you can adopt some online tool supporting the methodology. Kanbanchi is one of such tools. Want to try? You can make it right now! thanks. your wrote is very usefull for me. thanks again. I’m out of league here. Too much brain power on diysalp! Thanks for your comment, Abdullah! It indeed simplifies processes a lot. you give to me good information about kaizen so continuous in this way.greet thank you! very useful , prepared presentation during reading available for sharing, could not load application due to restriction from server. Very interesting and valuable article. Especially explanation 5W1H was what I looking for. superb thank you for writing it helps a lot in work shop. A very educative topic on quality management, very simplified techniques on how to run a production unit with minimal cost maximizing on quality output of quality products which results in efficiency in the process chain while involving every one in the process chain. Very enthusiastic to apply this concept in my work place. Is practical, focus on subject, great! I recommend to everyone to develope himself and the everyday life too. Thank you! Valuable of Organization culture. Reality Oriented Mind. Hey Vlad, this blog post saved our life! Thank you very much for sharing this valuable methodology for improving our productivity. We really appreciate it. Thank you very much for removing my foolishness.